The largest of all living turtles and is the fourth-heaviest modern reptile behind three crocodilians. Its lacks a bony shell, instead, its carapace is covered by skin and oily flesh. Instead of teeth, the leatherback turtle has points on the tomium of its upper lip, with backwards spines in its throat to help it swallow food and to stop its prey escaping once caught. They have been viewed as unique among reptiles for their ability to maintain high body temperatures using metabolically generated heat. Individuals may spend as little as 0.1% of the day resting. This constant swimming creates muscle-derived heat. Coupled with their counter-current heat exchangers, insulating fat covering, and large size, leatherbacks are able to maintain high temperature differentials compared to the surrounding water. 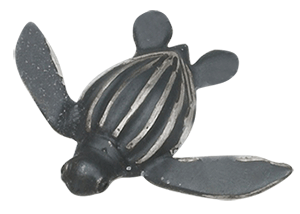 Leatherback turtles are one of the deepest-diving marine animals. Individuals have been recorded diving to depths as great as 1,280 m (4,200 ft). Typical dive durations are between 3 and 8 minutes, with dives of 30–70 minutes occurring infrequently. They are also the fastest-moving reptiles. The 1992 edition of the Guinness Book of World Records lists the leatherback turtle moving at 35.28 km/h (21.92 mph) in the water. More typically, they swim at 0.5–2.8 m/s (1.1–6.3 mph). These are the species with a cosmopolitan global range. Of all the extant sea turtle species, D. coriacea has the widest distribution. Sadly, the turtles are fastest declining large animals in the world. Many human activities indirectly harm their populations. As a pelagic species, leatherbacks are occasionally caught as bycatch. Pollution, both chemical and physical, can also be fatal. Many turtles die from malabsorption and intestinal blockage following the ingestion of balloons and plastic bags which resemble their jellyfish prey.